perceived contrast ratio and cuts down on glare, providing amazing picture quality even in direct sunlight. display’s brightness to optimize the power consumption and enhance the viewing experience. 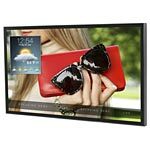 Providing unmatched capabilities, Xtreme High Bright Outdoor Displays are the perfect digital signage or entertainment solution for any professional application. Optically bonded, anti-reflective cover glass increases the perceived contrast ratio and cuts down on glare, providing amazing picture quality, even in direct sunlight. Daylight readable with LED backlight and full HD 1080p resolution for a bright, crisp picture. Includes Quarter Wave Plate polarizer, allowing for portrait and landscape installations. IPS panel provides color accuracy, even at the harshest of angles. Remote and Local monitoring, supported via IP addressable user interface, for temperature, humidity, and power draw diagnostics of the display.